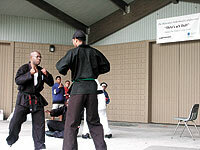 A martial arts demonstration at the Fatherhood Collaborative’s pre-father’s day celebration. Rushing in from the afternoon heat, Francis Vogel greets his wife, Brenda Del Valle, asks about his two-year-old daughter, Paloma, who is napping upstairs, and settles in his dining room to discuss the Milwaukee Fatherhood Collaborative. But in the middle of describing the network of services for at-risk fathers which he now runs, Vogel breaks off to think about his parents. “Every man has his own life story, and my example is unfortunately not as common as it once was,” he says. “My parents, Tony and Joyce, have been married now for 46 years. That longevity of marriage is an example that not many people have anymore,” Vogel says. “This position for me is more than just a half-time job, it’s more of a calling and a way to give back.” Quoting the Bible, Vogel adds, “From those to whom much is given, much is expected.” Vogel’s admiration of his own father and devotion to his family has inspired him to help others become better fathers. In March, Vogel joined the Milwaukee Fatherhood Collaborative, a network of support and social services dedicated to promoting and strengthening fatherhood among at-risk men, such as teen dads, and incarcerated and divorced fathers. The Collaborative helps “dads who need a boost to help them be strong, responsible fathers for themselves and for their families,” Vogel says. The Collaborative, which started in 1999 and until recently was run by volunteers, is a grassroots, Milwaukee-based network of 25 local services and agencies, including the New Concept, Vincent Family Resource Center, and some YMCA branches. The Collaborative holds conferences, outreach programs, and educational workshops for the agencies. Vogel, who earned a bachelor’s degree in history and English and a master’s in public policy and administration from UW-Madison, moved to Milwaukee in 1989 and settled in Riverwest. Before joining the Collaborative, he worked with nonprofit organizations in fund raising and board development. “He’s tenacious, he’s very organized, he’s persistent. He cares about fathers and their plight,” says Rev. LeHavre Buck, chairman and co-founder of the Collaborative and pastor at Harambee’s Triumph the Church. Throughout the interview, Vogel reflects on his personal experience. His own father, Vogel says, “is a wonderful dad and I still have a very close relationship. He demonstrated like so many men do, by example… the value of hard work and of being there for your family.” Recently, Vogel became a father himself when he and his wife, Brenda, adopted Paloma, a little girl from China. Fatherhood has made him “more ‘other oriented,'” Vogel says. “Being a father forces you to consider every day that there is someone on this earth who totally depends on you,” he says, laughing with awe at the incredible task. “It’s a sobering thing…I do feel a special responsibility being a coordinator.” Part of his job is to help other fathers discover the joys and the responsibilities of fatherhood. A lack of interest in fatherhood stems from example, Vogel says. “A lot of young men now are simply sperm donors. They haven’t been taught what it takes to really be a man and a father.” He points out that most men want to be good fathers but don’t always have the opportunity. “There’s a false notion of deadbeat dads. The core problem is dead-broke dads,” Vogel says. “The Collaborative helps men do what they desperately want to do.” What are the solutions to promoting fatherhood? Job training, educational training, technical training, anger management, and life skills training, says Vogel. In the next several years, Vogel plans to expand the Collaborative to a statewide network. Recently the Collaborative held a pre-Father’s Day celebration and resource fair that included a picnic lunch and entertainment for nearly 200 fathers and their families. In the meantime, Vogel plans to spend Father’s Day having brunch with his wife and daughter. “[Brenda] is a wife and mother and helps make me a better father,” Vogel says of his wife. While he sneaks off to check on Paloma, Brenda explains what makes him successful at his work. “He’s a very good people person, he has a nice way of approaching people. He makes them very comfortable,” she says. What makes him a good father? “He’s fun,” she says, smiling. “I watch him play with Paloma and he does a lot of silly things that a baby needs.” Earlier, when asked what makes fatherhood a worthwhile pursuit, Vogel explained it this way: “Fatherhood is a lifelong journey that is full of potential pitfalls — but it pays dividends beyond your wildest dreams.” For more info about the Milwaukee Fatherhood Collaborative, contact Francis Vogel at 414/874-7843. For direct services, contact Charles Richardson, St. Vincent DePaul’s Family Resource Center, at 414/374-0109 x 105, 2610 N. King Dr.